With its Verify segment, TEGNA hopes to build trust with its viewers. In this era of polarized discourse, declining trust in media and misinformation and disinformation, “transparency” and “authenticity” have become buzzwords thrown around in many newsrooms. While newspapers have added features like sidebars to their print stories and explanatory links online, introducing transparency and building authenticity in the linear medium of television newscasts is a trickier challenge. But TEGNA has come up with an idea that’s designed to meet that challenge. Even before President Trump was elected, TEGNA research showed that audience distrust in the media was a growing problem for news organizations. “Verify was needed even before the term ‘fake news’ became part of our culture,” TEGNA VP of News Ellen Crooke said. So in April of 2016, a group of TEGNA staffers met at one of their regular innovation summits to present ideas based on audience research and TEGNA management objectives. In this case, management challenged them to find ways to build trust in their news reports. The winning proposal: a segment in which reporters would fact-check the day’s news based on viewers’ questions. TEGNA funded a pilot at WFAA in Dallas, which puts its own unique spin on the idea: a segment called Verify Road Trip that takes viewers around Texas to answer questions about the news. The idea was inspired in part by Anthony Bourdain’s Parts Unknown. 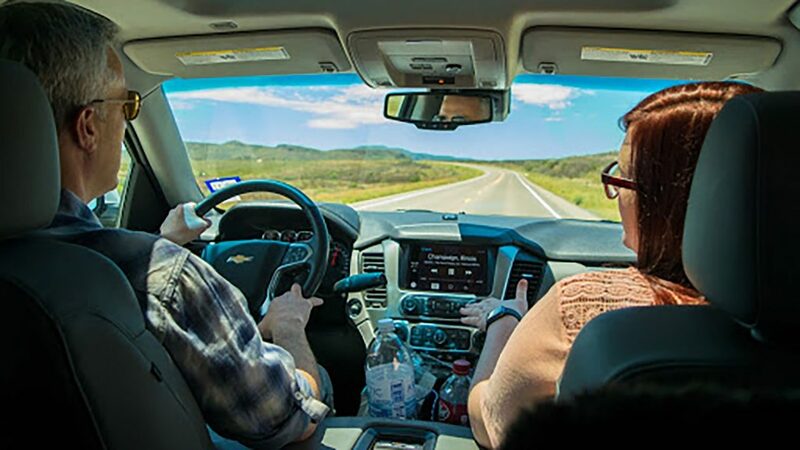 “All good ideas are just an amalgamation of lots of things building on top of each other,” said David Schechter, a veteran journalist who is the reporter, host and co-producer of Verify Road Trip. Schechter and his team have criss-crossed the state of Texas, covering everything from the border wall with Mexico, to craft beer in the Dallas Fort Worth area, to sinkholes in West Texas. Schechter and his team take the viewers through every step of their reporting process, giving the audience a better idea of where and how they source their information. “It’s a good response to people not trusting you. Show them how you did it. Maybe they still won’t, and that’s fine, but we’re not making it up,” Schechter said. For some of the segments — especially the longer, more in-depth ones — Schechter even takes an audience member out on the road with him and has him or her help report the story. These audience members go through a pretty lengthy vetting process before they ever make it in front of a camera, though. Schechter and his team want to make sure the co-reporters will have an open mind about the story, that they’re truly interested in the topic and that they’ll be able to conduct interviews — with Schechter’s guidance of course — while they’re on camera. WFAA started out producing six-to-ten-minute episodes each week, but the resource drain from that was hard to sustain. So as Schechter explained, Verify Road Trip has evolved into a longer, more in-depth story every other week along with shorter, more traditional fact-checking episodes weekly. The production costs and the time commitment to produce these longer videos also made them hard to replicate at stations around the country. The new idea: “snackable” Verify segments that involved reporters fact-checking a same-day story. 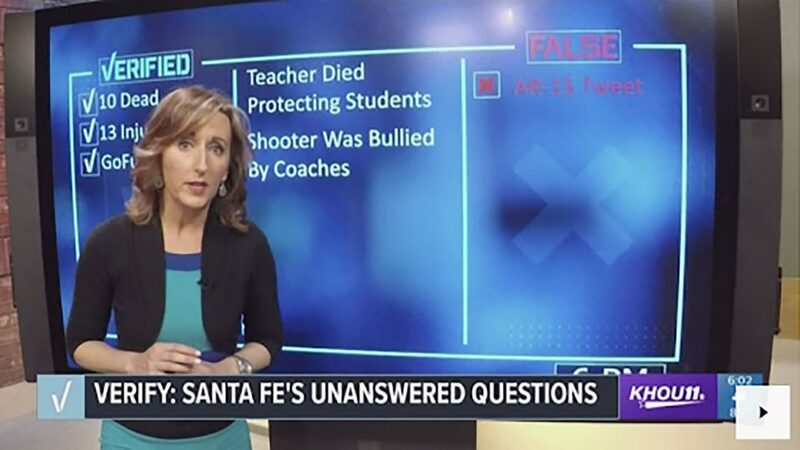 This time, a team at KHOU in Houston created graphics and a format — essentially a fact-checking “toolkit” for verification that TEGNA shared with every station. While the segments are not mandatory, the idea caught on around the group: in fact, WUSA in Washington and KPNX in Phoenix do a Verify segment every night. Eventually stations asked TEGNA for a national Verify team to answer questions about stories that were not necessarily local, but that audiences around the country were asking about. Now Jason Puckett, who’s based out of WCNC in Charlotte, produces a national Verify segment every day that any TEGNA station can use. Puckett says his team only focuses on what it can definitively prove true or false, trusting the viewers to make their own judgments based on the facts. “That’s what separates these stories in my mind from a lot of other outlets,” Puckett said. Most of the stories are day turns on topics that cover anything from your chances of winning the lottery to Taylor Swift as a political influencer. During the Judge Kavanaugh hearings, Puckett and his team addressed a confusing element rather than a single claim: whether senators can order an FBI investigation. Most daily Verify stories come from viewer questions. But during breaking news situations like the serial bomber in Austin, Puckett’s team is also “constantly monitoring the conversations on all of our digital platforms” and jumps in when misleading claims are gaining traction. The frequent updates on information floating around can often help calm the public and dispel unsubstantiated rumors, he says. In fact, some of Verify’s greatest success has been during breaking news. News directors scramble a team to help viewers sort out fast-changing information on the fly. Crooke cited KHOU’s coverage of the high school shooting in Santa Fe, Texas. Screenshot of KHOU’s coverage of the Santa Fe High School shooting. Back at WFAA, with Verify Road Trip in its third season and talk of a half-hour show built around the concept, Schechter reflects on the opportunity he has had to flex his creative muscles through TEGNA’s innovation initiatives. Do you have examples of new ways to build trust and transparency with your audience? Share them with us at cronkitenewslab@asu.edu. Article: Understanding how news works in the digital age: Verify, Verify, Verify. Read here. Article: Finally some good news: Trust in news is up, especially for local media. Read here. Article: Tegna asks viewers: What do you want to know about the news? Read here. Article: Americans feel they can best distinguish news from opinion in local TV news; worst, online news sites and social media. Read here.